Dr. Gene Gaddy, a Mississippi Gulf Coast native, was raised in a family of physicians in Long Beach and Gulfport. He graduated from Gulfport East High School in 1970 and undergraduate and medical school at the University of Mississippi in 1978. After a year of internship at Baptist Memorial Hospital in Memphis, he completed his residency in ophthalmology at the University of Mississippi Medical Center in Jackson in 1980. He has been practicing ophthalmology in Gulfport for over 30 years and has performed thousands of cataract and laser surgeries. Dr. Gaddy is certified by the American Academy of Ophthalmology and is on staff at Garden Park Hospital, and Gulf South Outpatient Surgery Center. 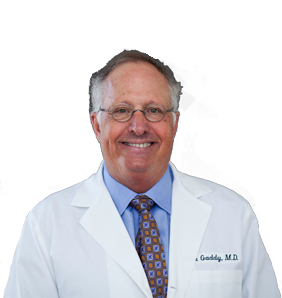 Dr. Gaddy is married to Sonja Gaddy, a registered nurse, and has four children. His favorite pastime is jazz piano where he plays locally at two churches on Sunday. He also enjoys fly fishing and Ole Miss football.